Network Janitor | The VAR-y good upsides to being a consultant! The VAR-y good upsides to being a consultant! Earlier today Ethan Banks wrote a really good blog posts about “Thoughts on Working as a Consultant for a VAR“. I found his point of view quite interesting and I will say I can understand his points. I can also say that I would rather be a consultant than a full time engineer at a customer site. 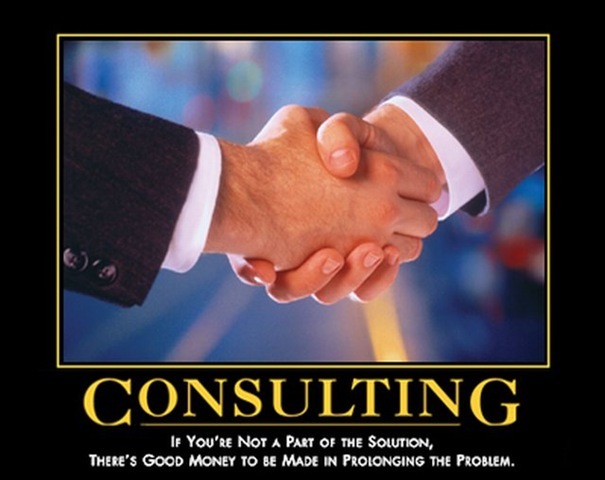 As a little bit of background I have spent most of my career working as a consultant. I did do a two year stint as network operations manager for a wireless ISP which itself was quite fast paced, but other than that Ive work as a consultant in one form or another. Im 32 years old, and I still love toys. Sometimes I think the only reason why Im in this industry is the ability to play with expensive and complex toys. And I get paid to do it! I enjoy the challenge of learning a new piece of equipment and deploying it into a customers network. I enjoy learning all the new opportunities that a new software update or a router line card can offer to my upcoming network designs (my sales guys also enjoy being able to sell those things to existing customers… bloody sales drones!). I have worked at my current employer for 10 months now and in that time I have worked on many projects, not the least of which has included rolling out the second Juniper QFabric deployment in Australia (and one of the first in the world), delivering security solutions based on high end data centre SRX devices including IDP, SSL Inspection and Proxying, a relatively large Juniper MAG deployment across multiple sites with failover, and numerous network audits across many verticals including finance, utilities, enterprise and service provider networks. Ethan’s posts hinted at being burned by his previous employer. I know I can attest to that over the past 15 years Ive been in the industry. Sometimes its the customers, sometimes its the employer. The right employer will understand your career aspirations and will endeavour to provide you with all the resources you need to be successful during both your time with them as well as your career beyond them. The right employer understands how often engineers change jobs in this industry and that what goes around comes around. Your employer needs to understand that certification is beneficial to him, but more importantly that you as the engineer need to understand the content of the exams you are passing. Perpetuating the degradation of industry certifications by promoting brain dumps or becoming a “puppy factory” for certifications churning out sub-par engineers devalues both the certification as well as your ability to sell your services to customers. The right employer will cover your expenses for gaining certification, and provide you with the resources, both equipment and time, to actually complete these career goals. If you’re lucky your VAR will give you access to both pre-sales and post-sales implementation work giving you a wider view point of the network life cycle as well as building up skills that end customer engineers will never get to practice. And you will do that many times a week! You’re supposed to know everything: I agree with Ethan that this can be stressful, but it doesn’t take long to pick up the habit of either being one google search ahead of the others, or as I often say “Not knowing the answer, but knowing where to find them”. If you work for a consulting firm that doesn’t require your customers to buy some form of vendor TAC support then you are further against the wall and you/they are not operating in your customers best interest. *Always* have the ability to escalate. You’re a commodity: Yes you are a commodity, but you also are (should be) “in demand”. If you are doing your job well, and your employer knows how best to leverage your skill set appropriately (not always in your control) then this works in everyones favour. If you are not doing your job well then you shouldn’t be a consultant, and if your employer doesn’t know how to effectively sell your skills you should be looking elsewhere. You will get abused, ignored and eventually get bored and quit or made redundant. Scary truth, but its better to move on and find something you are happier doing. You’ll sacrifice your body if you’re not careful: Well I’m not even going to pretend to deny this one. I am living proof that ignoring the health aspects of your life will creep up on you, but Im not convinced this is specifically related to VAR lifestyle. Any high stress, fast paced career can do this to you. You just need to keep these things in check. On a side note to this one, I’ve taken up a Paleo/Primal lifestyle for the past couple of months and Ive found wonderful improvements to my health without major sacrifices (in both time and diet), but thats a whole other blog post! Yes working for a VAR can be hard work. It can be fast paced and involve a lot jumping between contexts, but if you are like me you just may find that the very draw card to this career option. Sometimes I dream about working on a single network and finishing all those “little things” that I wish I could implement for all of the networks I build. Then I spend two weeks onsite at a customer and all I want to do is get out of there. If you are willing to invest 12 months of your life to “give it a go”, you will learn far more in that time, and touch a wider array of equipment than you could hope to touch in 3 technology refresh cycles at an end customer. And this is what keeps me coming back to work tomorrow!